With the ultimate goal of improving human health, Genes and Nutrition is an interdisciplinary journal which examines the relationship between genetics and nutrition. 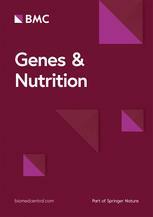 We publish original research articles and review articles on gene-diet and diet-gene relationships coming largely from animal, cell culture, and other experimental models. We also publish critical evaluations of human experimental data and preclinical research data, addressing the effect of bio-active compounds. The journal is ideal for nutritionists, healthcare providers, and all those interested in preventive medicine.